We’ve seen a plethora of tablet/laptop hybrids since Windows 8 launched back in October, but we certainly haven’t seen a lot of tablet/desktops. 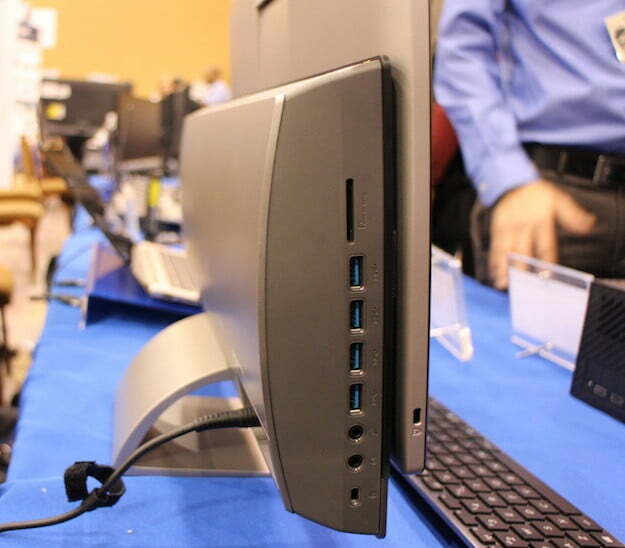 However, after hearing about Asus’ new Transformer All-in-One PC P1801, originally announced at Computex back in June, we were intrigued by the the possibilities of having a device that could not only work as a desktop AiO, but could also work independently as a tablet. Like us, you might be wondering how a desktop PC, which is generally a decently sized piece of equipment, could also double as a tablet. The Transformer AiO tablet/display is a whopping 18.4 inches, which makes us wonder if Asus is taking a chance by changing up the standard formfactors. We were excited to get some hands-on time with the Transformer AiO during CES to find out exactly what an 18-inch tablet feels like in the hand. After all, do people really need such a large tablet? We go hands-on to find out. Desktop and a tablet? Yes, please! The unique thing about the Transformer AiO is that both the tablet and desktop docks have their own operating systems and their own CPUs, meaning you’re more or less getting two computers for the price of one. The tablet/display runs Android 4.1 Jelly Bean and is powered by an Nvidia Tegra 3 processor and 1GB of RAM. The stand, or desktop part of the AiO, has up to 1TB of storage and features a third-generation Intel Core i5 0r i7 processor running Windows 8. Users can switch between the operating systems by pressing the button situated on the right side fo the tablet. Lifting the tablet out of its dock should have given us a mobile Windows experience in Windows Remote Desktop Mode, but the model we tested wasn’t the finished product and was running Jelly Bean when we removed the tablet from its dock. The nice thing about the tablet is that it can be used as a Windows 8 device anywhere in the house, as long as you’re in range of your Wi-Fi connection. That means you could easily detach the tablet and take it outside with you. 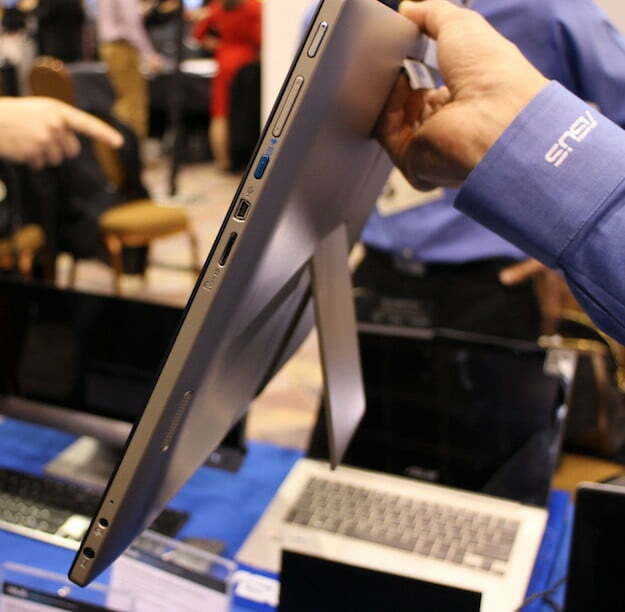 The 18.4-inch full HD LED-backlit IPS display looked sharp and bright when we checked it out on Pepcom’s show floor. Weighing close to six pounds, we were surprised that the tablet itself didn’t feel overly heavy. An easy-to-grip handle is included on the back of the tablet, which is the key to the lightweight feeling. The handle also makes it extremely easy to lift the tablet out of the dock. Another handy feature on the back of the tablet is a kickstand – a vital addition that makes it easy to prop up the oversized tablet outside of its dock. We have nice things to say about the included peripherals, too. The mouse has haptic feedback, and can act as the swiping function on Android when you’re scrolling. With dedicated buttons for each operating system, the keyboard is both Android- and Windows-friendly. 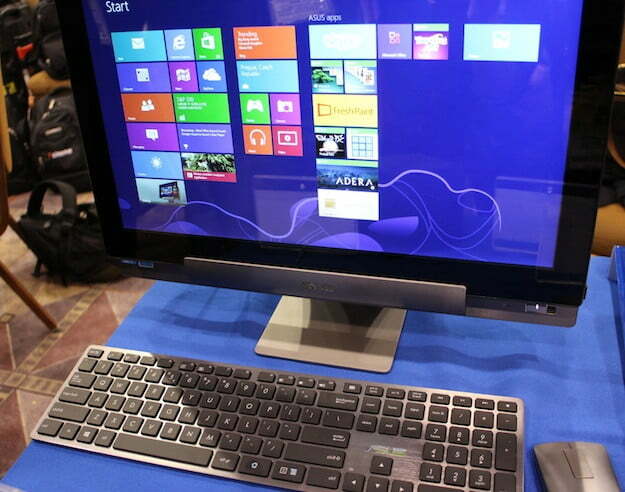 It’s a perfect example of how Asus has merged both Android and Windows into one machine. We like the thought of being able to use the tablet in full Windows 8 mode as long as we’re connected to our Wi-Fi network. However, we weren’t crazy about the fact that users will lose the Windows 8 experience when going outside of their wireless range. The tablet will switch from Windows 8 to Android, which makes us wonder what will happen to all of your on-screen content? What if your Wi-Fi goes out while you’re working on something and the tablet switches over to Android? Do you lose what were working on when the tablet switches over? Other than that limiting factor, there weren’t too many glaring downfalls apparent during our first look, which is clearly a good thing. 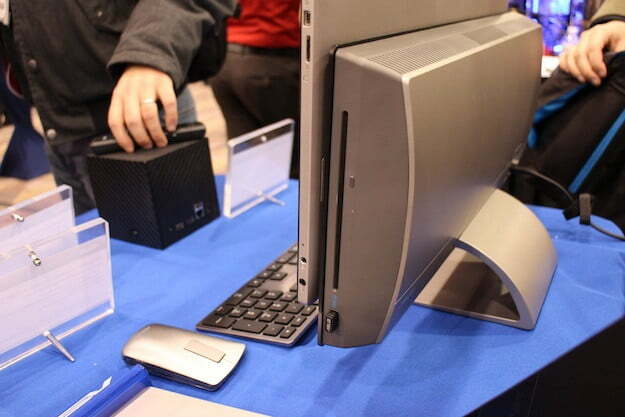 But do people really need a desktop/tablet hybrid? Asus is one of the first companies we’ve seen release a product of this type, but there might be a reason for that. In a time where even Apple, a company who was previously adamant about not making a smaller iPad, has its own “mini” tablet line, what’s going to make people want a tablet that’s over 10 inches larger? 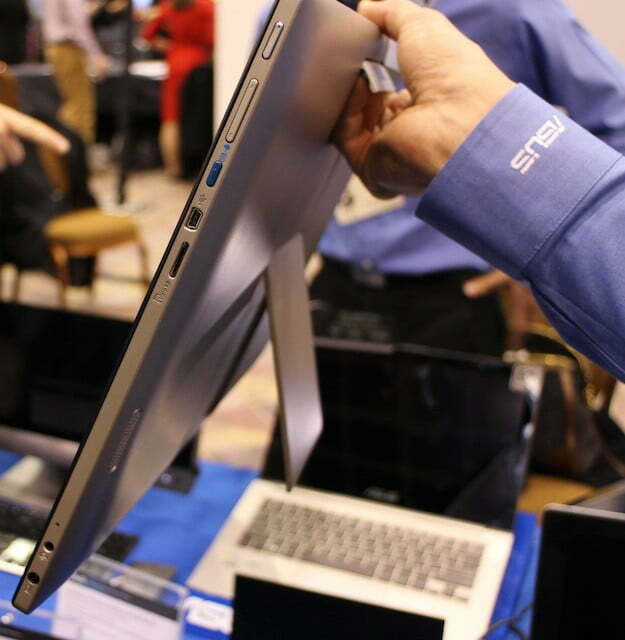 Isn’t smaller, thinner, lighter, and faster the way devices have been moving recently? Still, making a desktop computer with a detachable tablet is a fantastic idea. It might not appeal to everyone, but the Transformer AiO could emerge as a good home entertainment solution. It was extremely impressive how quickly the device switched between OSes, and Asus should be commended for creating what is probably the world’s largest Android tablet. The Transformer AiO starts at $1,299 for the Core i5 version with a 1TB drive in the base and 32GB of solid-state storage in the tablet. We’re looking forward to doing a full review of the Asus Transformer closer to its shipping date sometime in Q1.